Dirac was of course a member of the extraordinary generation of physicists who changed our understanding of the physical world through the development of quantum mechanics in the 1920s and 30s. These men were all in their 20s when they made their revolutionary discoveries, with one glaring exception - Erwin Schrodinger was, by the standards of theoretical physics, a ripe old thirty-eight when he stumbled across the famous equation bearing his name. When we look at the careers of these individuals we could be forgiven for assuming that if you are past thirty you will probably not make an important contribution to science. The legend of the Young Turks has not quite played out in other fields of science though. Now a paper in PNAS confirms what we suspected, that since the turn of the twentieth century there has been a general increase in the age at which scientists make their important discoveries. What is more surprising is that this increase exists more across time than across fields. The study looks at Nobel Laureates, but since many people who make Nobel Prize worthy discoveries never get the prize, the analysis applies to others too. So what does the paper find out? It finds out that in the early years of the last century, young men and women made contributions in every field at a relatively young age, often in their twenties. This was most pronounced for theoretical physics. Einstein famously formulated special relativity when he was a 26-year-old patent clerk, and Heisenberg formulated quantum mechanics when he was 24. The same was true for many other physicists including Bohr, Pauli, Dirac and De Broglie and the trend continued into the 70s, although it was less true for chemists and biologists studied by the authors. The reasons postulated in the paper are probably not too surprising but they illustrate the changing nature of scientific research during the last one hundred years or so. It is easiest for a brilliant individual to make an early contribution to a theoretical field like theoretical physics or mathematics, since achievement in such fields depends more on raw, innate ability than skills gained over time. In an experimental field it's much harder to make early contributions since one needs time to assimilate the large body of experimental work done and to learn the painstaking trade of the experimentalist, an endeavor where patience and perseverance count much more than innate intelligence. As the paper puts it, deductive knowledge lends itself more easily to innate analytical thinking skills visible at a young age than inductive knowledge based on a large body of existing work. This is true even for theoretical physicists where fundamental discoveries have become extremely hard and scarce, and where new ideas depend as much on integrating an extensive set of facts into your thinking process as on "Eureka!" moments. And this difference holds even more starkly for social sciences like economics and psychology where you find very few young people making Nobel Prize winning contributions. In these cases success depends as much on intellectual maturity gained from a thorough assimilation of data about extremely complex systems ("humans") as it does on precocity. But if this were purely the distinction, then we wouldn't find young people making contributions even to experimental chemistry and biology in the early twentieth century. The reason why this happened is also clear; there was a lot of low-hanging fruit to be picked. So little was known for instance about the molecular components of living organisms that almost every newly discovered vitamin, protein, alkaloid, carbohydrate or steroid could bag its discoverer a Nobel prize. The mean age for achievement was not as early as in theoretical physics, but the contrast is still clear. Even in theoretical physics, the playing field was so rife for new discoveries in the 1930s that in Dirac's words, "even a second-rate physicist could make a first-rate discovery". The paper draws the unsurprising conclusion that there is much more opportunity for a young person to discover something new in a field where little is known. This conclusion is starkly illustrated in the case of DNA. Watson and Crick are the "original" Young Turks. Watson was only 25 and Crick was in his early thirties when they cracked open the DNA structure, although one has to give Crick a pass since his career was interrupted by the war. What's important to note is that both Watson and Crick came swinging into the field with very little prior knowledge. For instance they both knew very little chemistry. But in this case this lack of knowledge did not really hold them back and in fact freed up their imagination because they were working in a field where there were no experts, where even newcomers could use the right kind of knowledge (crystallography and model building in this case) to make important discoveries. Watson and Crick's story points to a tantalizing thought- that it may yet be possible to make fundamental contributions at a young age to fields in which virgin territory is still widely available. Neuroscience comes to mind right away. Since this is a chemistry blog, let's look at the authors' conclusions as they apply to chemistry. 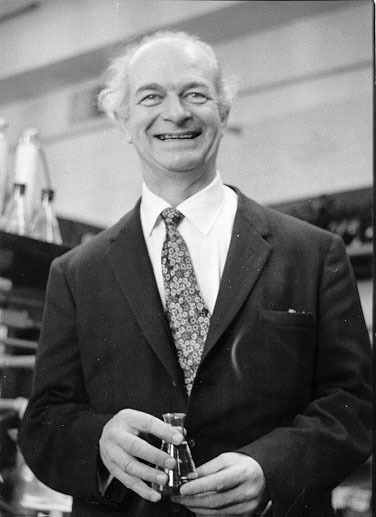 Linus Pauling provides a very interesting example since he plays into both categories. The "early Pauling" made his famous contributions to chemical bonding in his twenties, and this contribution was definitely more of the deductive kind where you could indulge in much armchair analysis based on principles and approximations drawn from quantum theory. In contrast, contributions by the "late Pauling" are much more inductive. These would include his landmark discovery of the fundamental elements of protein structure (the alpha helix and the beta sheet) and the first description of a disease at a molecular level (sickle cell anemia). Pauling did both these things in his 40s, and both of them needed him to build up from an extensive body of knowledge about crystallography, chemical bonding and biochemistry. It would be hard to imagine even a Linus Pauling deducing protein structure the way he deduced orbital hybridization. If we move to more inductive fields then the relatively advanced age of the participants is even more obvious. In fact in chemistry, in contrast to mathematics or physics, it's much harder to pinpoint a young revolutionary precisely because chemistry more than physics is an experimental science based on the accumulation of facts. Thus even exceptional chemists are often singled out more for lifelong contributions than for lone flashes of inspiration. Even someone as brilliant as R. B. Woodward (who did make his mark at a young age) was really known for his career-wide contributions to organic synthesis rather than any early idea. It's also interesting that Woodward did make a very important contribution in his late 40s - to the elucidation of the Woodward-Hoffmann rules- and although Hoffmann provided a robust deductive component, inspiration for the rules came to Woodward through anomalies in his synthesis of Vitamin B12 and his vast knowledge of experimental data on pericyclic reactions. Woodward was definitely building up from a lot of inductive knowledge. An additional factor that the authors don't discuss is the contribution of collaborations. From a general standpoint it has now become very difficult for scientists in any field to make lone significant contributions. In fact one can make a good case that even the widely cited lone contributions to theoretical physics in the 1920s involved constant collaboration and exchange of ideas (mostly through Niels Bohr's institute in Copenhagen). This was far from the case for most of scientific history, when you had people like Cavendish, Lavoisier, Maxwell, Faraday, Kekule and Planck working alone and producing spectacular results. But things have significantly changed, especially in the case of experimental particle physics and genomics where even the most outstanding thinkers can often work only as part of a team. In such cases it may even be meaningless to talk about the young vs advanced age dichotomy since no one individual makes the most important discovery. Finally, one rather disturbing reason that could potentially contribute to an even greater advancement of age in the context of important discoveries is left undiscussed. As the biologist Bob Weinberg lamented in an editorial a few years ago, the mean age at which new academic researchers receive their first important research grant has been advancing. This means that even brilliant scientists may be held back from making important discoveries simply because they lack the resources. While this trend has really been visible in the last decade or so, it could contribute as an unfortunate factor to the age-corrected generation of novel ideas. One only hopes that this does not make things so bad that scientists are forced to consider contributing to their fields in their 70s. Ultimately there's one thing that age brings that's hard to replace with raw brilliance, and that's the nebulous but invaluable entity called 'intuition'. As scientific problems become more and more complex and interdisciplinary, it is inevitable that intuition and experience will play more important roles in the divining of new scientific phenomena. And these are definitely a product of age, so there may be something to look forward to when you grow old after all. Nicely written Ashutosh. May be not having young chemists make important discoveries is part of chemistry's PR problem! The Dirac quote is misleading, as these are Pauli's lines in the Bohr institute's production of Faust. away from his advisor--- Faust.